Lush release many products over the year but my favourite launch has to be their Xmas range. It's the biggest (and in my opinion), the best. 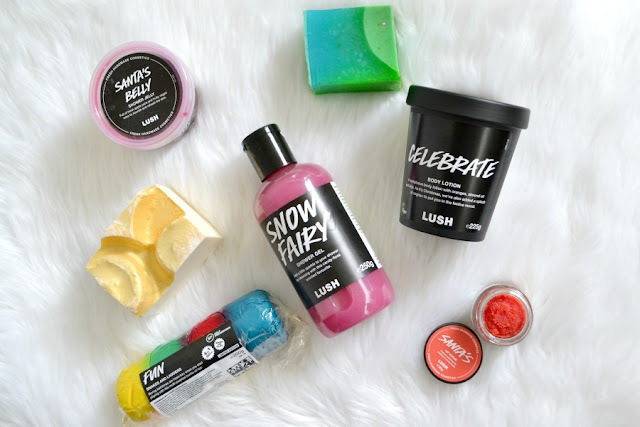 This year they have a great mix of old favourites (like Snow Fairy Shower Gel, Rose Jam Shower Gel and the Snowcake soap) along with some new limited edition products. I went into the city the other day and checked out their new range in the Rundle Mall store. I made a complete rookie mistake and didn't make out a list of the products that I was interested in, so I actually ended up missing out on looking at some of the new Christmas range. I was also sent some products from Lush that I'll include so you can see more of the Xmas range. It's not a Lush Christmas without the release of the Snow Fairy Shower Gel,* which is released in 3 different sizes. This is a cult favourite and you'll see people buying it in bulk. I've seen on Instagram that the UK sell a 1 litre bottle... which sadly we don't have. I'm sure that there's a petition for it to be available in Australia for next year!! I picked up the Snowcake Soap as it's a beautiful warm and cozy scent that reminds me of a cake baking. Another soap that I bought is the Baked Alaska Snowball Soap. This is completely the opposite scent as it's very uplifting and citrus based. I adore this scent. I have it in my shower at the moment and it's beautiful to use every morning. Both soaps are sold out online, so get in quickly to a store before it's sold out. The Baked Alaska soap is my favourite product from the range and I really hope that they release it as a permanent product! I love their bath products, but we have a large spa bath that takes ages to fill up so I didn't pick up any of the bath range. I was sent the Snakes And Ladders Fun. * This is a really cool multipurpose product that you can use both in the bath as a bubble bar or in the shower. You can also use it to wash your hair or even your clothes! Lush sent me the Celebrate Body Lotion* which smells amazing. It's a really uplifting scent, which works perfectly with the Baked Alaska soap. One product that I missed out seeing instore was the Christingle Body Conditioner. I adore their body conditioners and I'm sad that I missed picking it up. Another product that I missed out seeing is the Cranberry Festive Fresh Face Mask, which sounds lovely. I adore the Lush lip scrubs and picked up the Christmas Santa's Lip Scrub. I don't use a lip scrub everyday, but love using it when I'm going to wear lipstick. Lush have a great mix of prepacked gifts which range in price from $14.95 up to $129.95. You can also make up your own packs. They have these cute Knot Wrap* cloth gift wrapping which is fantastic as you can reuse them again and again. 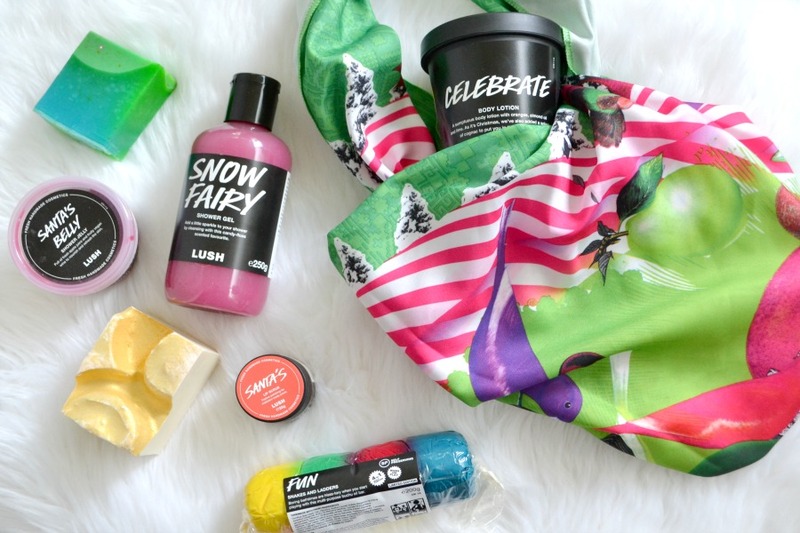 Have you picked up anything from the Lush Xmas range? Will you be purchasing anything for yourself or someone else from Lush? Hahahaha I feel the same. It's like you need to stop what you're doing and go straight out and buy it! Ohhh no what a shame!! Ordering online is perfect for you then!